Event Description Voodoo & Burnt Rubber is back for another summer! 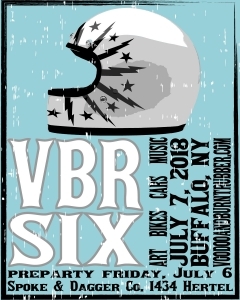 VBR SIX is excited to back at the Essex Street Art Center for another year. This year we will be featuring new builders and artists that pull from the subculture that builds our Buffalo Motorcycle Community. To keep each event unique, we have some great plans for this year including new vendors, Tin Type Photography, and a Biltwell Helmet Art show with a twist, a tiny little twist... Be prepared to feast on good eats from Essex Street Pub, enjoy some Sailor Jerry Cocktails, see great bikes and meet new friends. Music will be provided by our home town pals the Blue Ribbon Bastards. Spoke & Dagger Co. sponsors will be hosting the Charity raffle on Friday July 6th starting at 7:00pm. Get some great swag and maybe even pick up some ink from their neighbors 5 Venoms Tattoo. 7:00 PM - 12:00 AM drinks, raffles & good times! The Pre-Party is the place to be for a chance to take home some amazing raffle prizes!! Our amazing sponsors, Spoke & Dagger Co. have invited us to throw a party at the shop. Located at 1434 Hertel Ave, Buffalo, NY 14216, you will get a chance to see the great shop they have built, and take home some amazing swag! Our sponsors have been incredibly generous this year, and we want you to walk away with it all! Dixxon Flannels, Biltwell, Hijinx Apparel. Lowbrow Custoims and more!! 8:00 PM: VBR SIX wraps for another year. Check out our website for complete information and give us a follow on Facebook and Instagram. See you soon!